Based on reviews from 7 experts and 30,726 users. Learn how our rankings work or see our guide to New Balance training shoes. Updated Apr 2019. New Balance training shoes, much like all of the brand’s offerings, use technologies that will allow wearers to perform their best. They use upper materials that securely lock the foot down and keep it supported during strenuous activities. The midsole may use multiple technologies to create a platform that effectively absorbs shock and provides stability. The outsole has enough grip to keep the foot planted without hindering dynamic movements. Power walking, CrossFit, HIIT, dance class, aerobics, cross-training - these are just some of the activities people get into these days if they want to stay fit or get in shape. Proper training footwear could help a person achieve their goal but the wrong pair could land them in the emergency room because of foot issues. There are several factors to consider when shopping for New Balance training shoes, including the type of activity the wearer will engage in, the price, the fit and sizing, etc. Depending on the range of activities they are intended for, New Balance trainers can be divided into two main categories: workout shoes and walking footwear. Some of these shoes look alike, but there are specific technologies that make them suitable for the category they fall into. 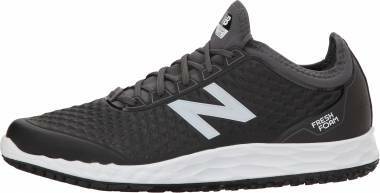 For those who need a shoe for daily workouts, gym sessions, aerobics classes, or high-intensity training, New Balance offers its workout trainers. The shoes in this segment are crafted to accommodate various activities. They feature a supportive upper made of leather, suede, synthetic, mesh, or knit materials. Their sole units are created to be low-profile in order to accommodate agile and multi-directional movements while delivering ample cushioning for high-impact activities. Some of the models are made with extra reinforcements for climbing ropes and a Vibram outsole for better traction on different types of surfaces. Walking footwear from New Balance could be used for everyday strolls, doing chores, or even power walking around the neighborhood. What differentiates them from other models is the use of special technologies such as stabilizing posts or the Walking Strike Path. These add-ons ensure comfort throughout the heel-to-toe transition and prevent the foot from excessively rolling inwards or outwards. Some of these walking shoes are designed to match more casual outfits, some feature an athletic style similar to workout shoes, and some resemble hiking shoes with their waterproof membrane and trail-ready materials. New Balance training shoes cater to both men and women. The size availability depends on the model of the trainer, but in general, men’s footwear ranges from US size 7 to 15 while the women’s versions are available from US size 5 to 12. Half sizes are also available for both genders. As for the width, New Balance training shoes are known for offering their shoes in multiple width options. So, along with the Medium profiles, you will be able to find Narrow training shoes as well as Wide and Extra Wide models. One of the most influential factors when purchasing a new item is the price. Not everyone can afford to go over the budget, so it is wise to invest in something that won’t break the bank. 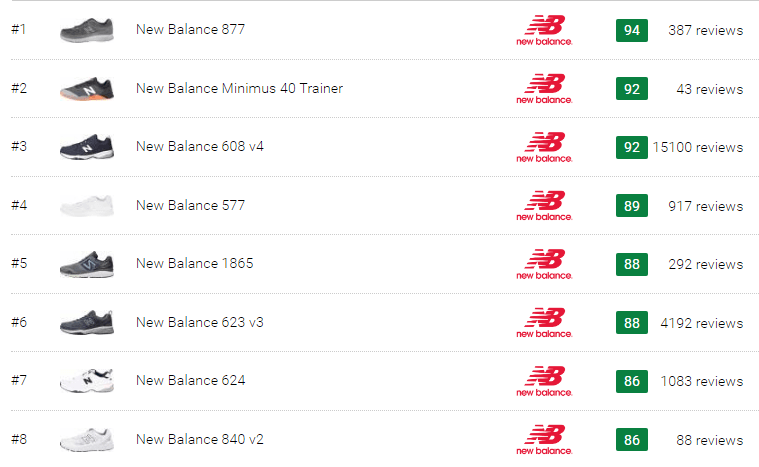 New Balance training are offered at differnt price points, ranging from $50 to $130. During sales, a pair of training shoes could go as low as $30. Here at RunRepeat, we scour the internet to find the best deals for the pair of New Balance training shoes you want. Just click on a model and you will be presented with a list of offerings from various online retailers. It ensures that you get the best price at any given time. What do the numbers and letters on New Balance training shoes mean? For years, New Balance used a combination of numbers and letters to name their shoes. But recently, the brand started adding words that describe some of their new offerings. The reason behind the use of numbers and letters is to make it easier to identify what purpose the footgear serves. “M” or “W” appearing at the beginning signifies that it’s either a men’s or a women’s model, while “U” stands for unisex. New Balance training shoes for cross-training have “XT” on the name. “W” refers to walking shoes and so on. As for the numbers, the first two digits mean the number of technologies incorporated into the footwear. The general rule is, the higher the number, the more special features it has. As for the last digit, it signifies the series number or how current the model is. Can New Balance training shoes be customized? Though New Balance offers customization of its shoes, it is only applicable for lifestyle and baseball footgear. The company has yet to offer customization of its training shoes. On the upside, there are a lot of New Balance training shoes to choose from that will satisfy the needs of most individuals. 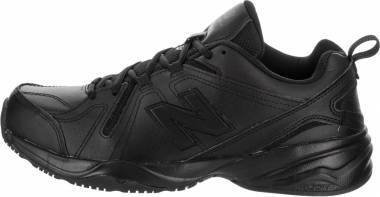 When should I replace my New Balance training shoes? According to New Balance, no exact formula would determine when a person should change training shoes because there are several factors to consider. They include the frequency of footwear use, the level of activity, the weight of the user, as well as the conditions in which a shoe is being used. 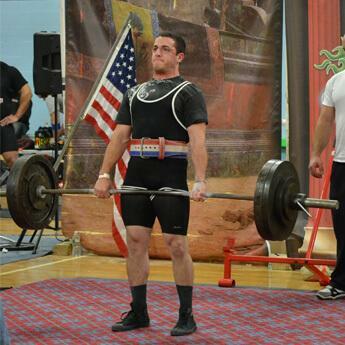 As a general rule, cross-training shoes are replaced every six months. They should also be replaced when there are signs of deterioration such as the outsole losing traction, the upper becoming too loose, and the midsole no longer being effective in cushioning the foot. Do New Balance training shoes come with arch support? Given that the company started off by manufacturing arch supports, it has surely brought this experience into its footwear production. One of the most recent and common technologies that New Balance uses to correct the gait is the Rollbar. It is a motion control feature that helps people who have a tendency to excessively roll their foot inwards or outwards. It is made of a molded plate that goes under the heel and connects two posts, one at the medial side and the other on the lateral side. This construction is meant to reduce rearfoot movement and stabilize the heel-to-toe transition. This feature is typically found in the brand’s motion control walking shoes. If you are unsure whether you need a training shoe with a motion control feature, it is recommended to consult a podiatrist who will have your gait checked. How do I clean my New Balance training shoes? 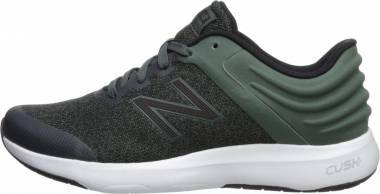 New Balance training shoes come in different styles and use various materials such as suede, leather, synthetic leather, mesh, and knit fabric. There is no universal way to clean all New Balance training shoes because one method may work for one model but would not be effective for another. You need special cleaning solutions for leather and suede, and users should follow the instructions on the container to effectively remove dirt from the said trainers. New Balance does not recommend cleaning their footwear—including the ones made of synthetic leather, mesh and knit—using a washing machine. The tumbling action could damage the product. Instead, use a damp cloth to wipe down the shoe. If dirt is caked in, using a soft bristled brush and mild detergent could help remove the dirt. Rinse it by using a clean damp cloth. After which, air drying for 24 hours is needed to ensure that all parts are completely dry. Do not dry it in direct sunlight as that could also damage the shoe. … that New Balance started off as a company that sold arch supports to make shoes fit better? The company’s founder, William J. Riley, built the arch supports based on the mechanics of a chicken’s foot movement. He concluded that the three-pronged foot created the perfect balance and that was what influenced him to name the company The New Balance Arch Company. Over the years, New Balance arch supports gained a following. Because of how effective their arch supports were, athletes began requesting the company to create full-on sports shoes. So, in the 1930s the company started producing orthopedic shoes for baseball players as well as track and field athletes. … when the N logo was first designed, people pointed out that it could be confused with the Nike brand? Terry Heckler, the designer, was aware that Nike was a more popular brand and was making more money, so getting confused with them could also increase their sales. … that for decades, New Balance has not sponsored any athletic teams or used celebrities and athletes to endorse their products? Instead, they featured stylishly-geared senior citizens, referred to as Ma and Pa Balance, to show consumers that their footwear is for everyone - not just athletes or fitness enthusiasts.